The Pleurothallis orchids are one of the largest genera in the orchid family. There are a lot of other closely related genera of pleurothallids, mostly with similar care requirements. 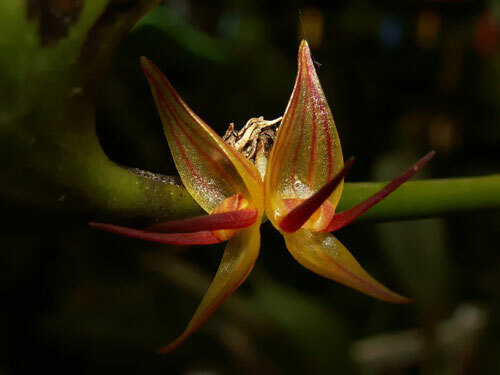 Most are miniature orchids, and many are quite tiny indeed Ñ many have sprays of flowers each a millimeter wide, on plants about a centimeter high. Most pleurothallids really like high humidity; 70% should be considered a minimum. Most originate originate in cloud forests in the Andes, where 100% humidity is not unusual. It's easiest to provide this humidity in an orchidarium, and the plants are generally small enough that you can put quite a large collection in there! Though there is a great deal of diversity in this genus, most like cool temperatures that stay below 70°F (21C). If temperatures get too hot, they will quickly dry out, shrivel, and die; possibly in a matter of hours. The higher the light, the cooler the temperatures need to be, and vice versa. Most species like low-to-intermediate lighting; 700-1500 footcandles is reasonable. Most pleurothallids hate to dry out. Water as they approach dryness if you are able to provide plenty of humidity; keep them moist more consistently if the humidity is low. Good potting mixes for these orchids include fine-grade fir bark or New Zealand sphagnum moss, usually in small plastic pots. You can also grow them mounted on twigs or slabs of bark, preferably with sphagnum moss around the roots. Show off your best Pleurothallis! I'm really a fan of pleurothallids, so please show off your best Pleurothallis and related plants by uploading pictures below! Say how you grew them, too; other readers will find that helpful to know. Also check out my tips on taking pictures of orchids for help showing them off better!